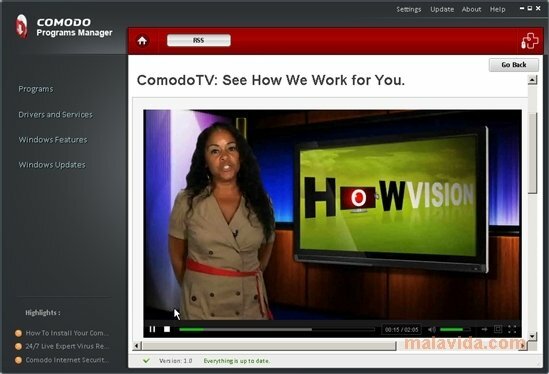 Comodo Programs Manager is a powerful solution to manage all the programs installed on your computer. Once installed you will be able to access the information about all the applications installed on your computer, with the added possibility to uninstall or repair them. But Comodo Programs Manager not only offers quick access to lists with the utilities installed on your system, it also includes the drivers and available services, as well as allowing to view other data like the path, the status, a small description or the by which each of them is known. Other options that it offers is to simply manage many system features, like for example, installing and uninstalling some components (like games) or activating/deactivating some services. To make sure that any operating carried out by error doesn't affect the computer's performance or the installed programs, it will also be possible to resort to the backup option offered by the application. If you are looking for a compact way to manage your programs and the features of your operating system, download Comodo Programs Manager. Works on Windows XP or above.